WEST LAFAYETTE, Ind. - The nation's fastest campus supercomputer has been built at Purdue University. Nicknamed "Carter," the supercomputer was ranked 54th this week on the latest international Top500.org list of the world's most powerful supercomputers. The supercomputer was built using the latest technologies from Intel, HP and Mellanox, including not-yet-released Xenon E-5 "Sandy Bridge" Intel processors and HP Proliant servers. The supercomputer was funded through a cooperative program in which faculty members pool research funds to purchase computing resources. Carter is the fastest supercomputer installed at a college campus that is not a part of a national center and is for campus use. At Purdue, Carter is already being used for a variety of scientific research projects. Alan Qi, an assistant professor in computer science, statistics and biology, is using Carter to identify cancer stem cells based on massive high-dimensional flow cytometry data. New theories about cancer therapies indicate that cancer growth can be more effectively curtailed by specific treatments targeted at cancer stem cells, which are responsible for growing new cancer cells. "Currently the massive patient data is examined manually by a technician; this procedure is obviously very slow and prone to errors. Carter allows us to analyze the data by new advanced statistical models and to have more accurate results in a couple of hours," Qi said. Michael Baldwin, an assistant professor of atmospheric science, is developing computational techniques to predict hazardous weather in the United States, such as tornadoes, hurricanes and blizzards. He is also developing improved modeling tools to determine how climate change affects severe weather. "We need as much computing cabability as we can get to make our forecasts as detailed as possible," Baldwin says. "In our models, we combine physical processes of the atmosphere with high-resolution data from weather radar and satellites. We can use Carter to create useful forecasts that the public can use and potentially save lives. "Carter is running twice as fast as the supercomputer we were using and is using only half of the nodes. That will allow us to scale our models for better forecasts." In addition to these projects, Carter is also being used to study the quantum effects of future computer chips and to study the effects of greenhouse gases other than CO2 in the atmosphere. "This groundbreaking supercomputer shows what is possible when researchers, campus IT staff and corporate partners work together as a close team," said Gerry McCartney, chief information officer, vice president for information technology at Purdue and the Olga Oesterle England Professor of Information Technology. "Carter is the fastest research computer at any institution that was completely paid for with faculty and university funds. It was built because Purdue, Intel, HP and Mellanox shared a vision to create a new resource for scientific discovery." Constructing Carter was a team and global effort. The team that designed and built Carter was composed of six Purdue staff members; 11 HP staff members, including one person who contributed from Ireland; three Intel staff members, two of whom are based in Russia; and five staff members from Mellanox, four of whom traveled from Israel to work on site at Purdue. Carter is named for Dennis Carter, a Purdue alumnus who earned his master's degree in electrical engineering in 1974. Carter was responsible for developing the innovative "Intel Inside" marketing campaign, which debuted in 1991. Carter was built with a high-performance HP ProLiant server cluster based on the HP ProLiant SL6500s Scalable System with 648 server nodes featuring 1,296 future Intel Xeon E5 family processors totaling 10,368 cores. With these processors, Carter's servers can increase application performance up to 70 percent compared to the current generation. 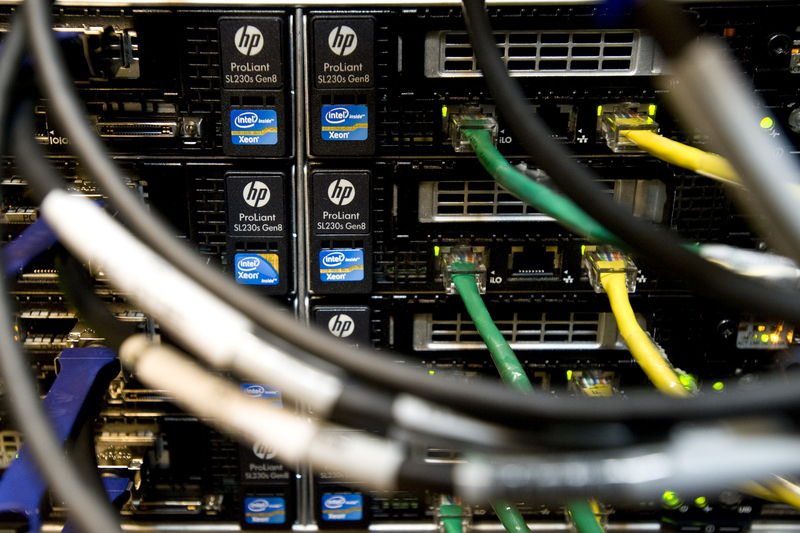 "Purdue required a server platform that offered unmatched compute power without increasing system footprint or energy use," said Paul Santeler, vice president and general manager of Hyperscale Computing, HP Industry Standard Servers and Software. "We're delighted that HP ProLiant technology will deliver the exceptional performance needed to help accelerate Purdue's critical research initiatives in cancer treatment, meteorology and environmental sustainability." At 186.9 teraflops capacity, this is the fifth Purdue supercomputer to be internationally ranked in the last four years, and Purdue has three supercomputers - Carter, Rossmann and Coates - on this year's rankings. The TOP500 Supercomputer Sites project has been ranking the 500 most powerful known systems twice a year since 1993 as a way of detecting and tracking trends in high-performance computing. Rossmann and Coates placed 208 and 474 on the latest list. Raj Hazra, general manager of high-performance computing for Intel, said Carter provides three times more performance than Purdue's 2008 supercomputer, Steele, while consuming less than half the energy and occupying half the space. "These benefits are achieved thanks to numerous technology improvements that include Advanced Vector Extensions (AVX). The improvements found in our new microprocessors make them up to two times faster than our previous Xeon generation and much more power efficient," Hazra said. "We at Intel are very excited as this is one of the very first supercomputers built on our upcoming Intel Xeon E5-2600 series processors. Being part of the Carter supercomputer project is an honor; learning it will be used to support numerous groundbreaking scientific projects is how we envision our technology helping to change the world." In addition to the high-speed processors, the 648 nodes in Carter are connected via a Mellanox FDR InfiniBand network, which transfers data at 56 gigabits per second (GB/s). FDR InfiniBand doubles the throughput of data over previous designs, allowing Carter to process more data than was previously possible, said David Barzilai, vice president of marketing at Mellanox Technologies. "We applaud Purdue's initiative to build the Carter supercomputer to drive the next era of scientific and medical research that exploit the performance and efficiency benefits of Mellanox's FDR 56Gb/s InfiniBand server and storage I/O solution," Barzilai said. "Mellanox's FDR InfiniBand I/O solution, with PCI-Express 3.0 support, delivers more than 12GB/s bi-directional throughput, two times higher compared to previous InfiniBand generations, reduces network latency to sub 1usec, and delivers application acceleration and offloading to achieve the highest scalability and system utilization. We look forward to continuing our collaborations with the university, Intel and HP to deliver exceptional performance for Purdue's research activities." Purdue's "starting five of supercomputing" - Carter, Hansen, Rossmann, Coates and Steele - are all the result of Purdue's Community Cluster Program, which was the recipient of Campus Technology magazine's Innovators Award in 2010. Note to Journalists: Purdue CIO Gerry McCartney will be at SC'11 on Nov. 14 and 15 and available for interviews.